Welcome to Hookah Company L.L.C. ("Hookah Company"). Before you use the Hookah Company Web Site at www.hookahcompany.com (the "Site"), please read the following terms which govern your use of the Site. By using the Site, you agree to follow and be bound by the terms and conditions of this Agreement (the "Agreement"). Hookah Company reserves the right to change the terms of this Agreement at any time and without notice. Your use of the Site following any such change constitutes your agreement to be bound by the terms as changed. We may change, move or delete portions of, or may add to, the Site from time to time including, but not limited to, content and equipment and/or software needed for access or use. We reserve the right to refuse service to anyone for any reason at any time. Minor Compliance NOTICE: You must be of legal age or older in your location to purchase our products. In an effort to combat credit card fraud and to prevent the purchases of our products by minors, HookahCompany.com reserves the right to request additional verification before an order is processed and shipped. We only ask for this information to verify the identity of the credit card holder and said information is not shared with outside parties. A small percentage of our cusotmers may not be verifiable due to limited availability of publicly available information contained within Age Verification databases. If this happens, we will attempt to contact you via phone and email to verify your age. To do this we typically require a copy of your driver's license or some other form of government issued ID that verifies your date of birth. Smoking shisha tobacco is not a safe alternative to smoking cigarettes. Shisha tobacco can cause lung cancer and heart disease. Shisha smoking can cause cancers of the mouth and throat, even if you do not inhale. Shisha smoking increases the risk of infertility, stillbirth and low birth weight. Placing your order with Hookah Company constitutes an offer, which Hookah Company reserves the right to reject or approve at its discretion. No contract will arise until Hookah Company has accepted your offer by approving your order. HookahCompany.com wants you to be 100% satisfied with your order. You may return all unused items purchased at HookahCompany.com within 30 days of the original delivery for a 100% refund (less shipping costs). Items (including freebies) left out of the returned package will be deducted from the refund at full retail value. For domestic returns, we do not charge a restocking fee, however "refused" international orders are subject to a 15% restocking fee. Please be sure to carefully read the instructions below on how to return/exchange an item. We will replace or exchange defective or broken items free of charge within the limitations of the 30 day time period and the unused condition of the returned items. For returns/exchanges other than broken or defective items, the customer maintains responsibility for the return shipping amount. Due to certain liabilities and legal regulations, any used items (i.e. used Hookah pipes, used Hookah hoses, or any other used accessory) or opened items (i.e. opened boxes, packaging, or jars of shisha tobacco, opened coal packs, or any item where the "seal" has been broken) are not returnable. All resent items will be shipped by UPS ground domestically. All returns must be returned with an approved RMA (Return Merchandise Authorization) and are thoroughly inspected once we receive them before a credit is issued. All returns/exchanges require an approved RMA (Return Merchandise Authorization) number. RMA requests can be submitted online, or you may call us toll free and request an RMA by phone. 1. Login to your account via log in page and click on "View Previous orders"
3. Scroll down to the bottom and click on "Request a Return Authorization (RMA)"
4. Select the items you wish to return and the reason you wish to return them (i.e. "The replacement base I ordered did not fit my hookah, I would like to try the small base"). Click "continue." You will receive an email within 24-48 hours with detailed return instructions. Please contact us by email or by phone if you do not receive an RMA email within 1-2 days, or need a rush to be placed on any replacement parts. For domestic returns (returns coming from the U.S.) please allow 2-3 weeks for a returned item to be credited back to your account. This time period includes the transit time for us to receive your return from the shipper (5 to 10 business days), the time it takes us to process your return once we receive it (3 to 5 business days), and the time it takes your bank to process our refund request (3 to 5 business days). In many cases, you will receive a refund much quicker. We'll notify you via e-mail once your refund has been processed. Feel free to contact us regarding the status of your return. Shipping All orders are packaged up with the proper and discreet packaging materials so orders arrive in perfect condition. Domestic orders usually ship out within 1-2 business days. 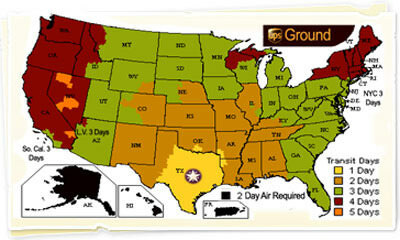 All domestic orders within the continental United States are shipped via United Parcel Service (UPS). The shipping time is 1-5 business days depending on your geographic distance from us and the method of shipment you choose (see below UPS Ground map for estimated delivery times). Please note that because orders are picked up at the end of the business day, the day that an order ships does not count as a "shipping day." All orders are shipped from Austin, Texas. For orders shipping to P.O. Boxes, APO Addresses, and Alaska and Hawaii, we ship via United States Postal Service (USPS). Special handling requests (e.g. "leave package behind gate") can be made in the "customer comments" section during the checkout process. Canadian OrdersTobacco duties are due to the Canadian Government and there is very little we can do about it. Because duty rates fluctuate and vary from province to province, we advise that you contact your local customs office to get the most recent and up to date information regarding duties. We are legally required to ship Canadian packages as commercial merchandise including a paper invoice listing the full retail value of the order. There are no exceptions. Any additional duties assessed on an order are the responsibility of the customer. Our advice is to be prepared to pay any duties if necessary. Note: "Refused" Canadian orders are subject to a 15% restocking fee. USPS Priority Mail International: this option usually takes 7-10 business days to arrive but may take longer due to processing at Customs. Tracking information will be provided to you once your order ships, and you can track you package at www.usps.com and www.canadapost.com once it has crossed the border. USPS Express (EMS) International: this option usually takes 3-5 business days to arrive but may take longer due to processing at Customs. Tracking information will be provided to you once your order ships, and you can track your package at www.usps.com and www.canadapost.com after your package has crossed the border. International Orders (Outside of North America)We ship internationally to Central America, South America, Europe, Asia, and Australia. The shipping costs are based on your location, the total weight of your order, and your desired shipping method. Your shipping options will be provided to you during the checkout process. Please select "USPS" from the drop down menu on the "Select Shipping Method" page (UPS rates will not be returned for international orders). If a product is received defective, Hookah Company will gladly replace it or provide a credit. In some instances, items are damaged during shipping. Hookah Company will replace any damaged product. A photograph may be requested for insurance claims. Hookah Company must be notified of any damaged or defective product within 10 business days of the customer receiving the order. Unless otherwise noted, all materials, including images, illustrations, designs, icons, photographs, and all copy, content, source code and other written and visual materials on the Site (collectively, "the Property") are the exclusive copyright, trademark, or other intellectual property owned or licensed by Hookah Company. The Site as a whole is protected by U.S. and international copyright, trademark and all other intellectual property law. All worldwide rights, titles and interests in and to the Property are owned or licensed by Hookah Company. All other trademarks, service marks, product names and company names or logos appearing on the Site are the property of their respective owners. Any use of such trademarks, service marks, product names and company names or logos, including the reproduction, modification, distribution or republication of same without the prior written permission of the owner of same, is strictly prohibited by U.S. and international law. You, as the user, have a limited license to download or copy the Property on this Site for personal, noncommercial use only. Violation of Hookah Company's Intellectual Property Notice will result in automatic revocation of this license. No right, title or interest in any downloaded materials or software is transferred to you as a result of any such downloading or copying. You may not reproduce (except as noted above), publish, transmit, distribute, display, modify, create derivative works from, sell or participate in any sale of, or exploit in any way, in whole or in part, any of the Property on the Site, the Site as a whole, or any related software without the prior written permission of Hookah Company. You may not use any meta tags or any other hidden text utilizing any of the Property, including Hookah Company's name or web address, without the express written consent of Hookah Company. Further, you may not frame any of the content, deep-link to the Site, trespass or scrape the Site using robots, data mining, automated agents, or any other data gathering or extraction tools without prior written permission of Hookah Company. All comments, feedback, suggestions, ideas and other submissions disclosed, submitted or offered to Hookah Company or otherwise disclosed, submitted or offered in connection with your use of the Site shall be and remain Hookah Company's property. Such disclosure, submission or offer shall constitute an assignment to Hookah Company of all worldwide rights, titles and interests in all intellectual property rights in such comments, feedback, suggestions, and other submissions.